Directing Ronaldo – Justyn Barnes Media Ltd.
Piecing together a selection of the images from Patrik Giardino’s incredible photo shoot with Cristiano Ronaldo to create the two-metre wide gatefold that would appear in the limited edition United Opus. It was and remains the most expensive photo shoot I’ve ever been involved in. It also represented a huge act of faith. Not only because of the money involved in employing and flying in one of the best photographers in the world from Los Angeles to Manchester, but for the fact that our 20-year-old subject had not yet proved himself to be the football über-star he has since become. Back in 2005/06, I was editing a behemoth of a limited edition book called the United Opus. Eight-hundred-and-fifty pages long with each page measuring 50cm x 50cm, containing 400,000 words, 2,000 images, and weighing in at approximately 38kg, a reviewer for The Times would later refer to it as ‘not so much a coffee-table book, as the the coffee table’. The brief for me and the rest of the editorial, photographic, design and reproduction team was to produce the ultimate book on Manchester United Football Club. This meant commissioning the best sportswriters, scouring the archives for the rarest and most exciting images from the club’s history and commissioning over 40 brand-new interviews and photo shoots with club legends. We included three show-stopping 200cm x 50cm gatefold images in the Opus. One of these we decided to devote to the thrillingly talented Cristiano Ronaldo. On seeing Ronaldo’s debut for Manchester United in 2003, George Best had told me: ‘There have been a few players described as ‘the new George Best’ over the years, but this is the first time it’s been a compliment to me.’ Two years on, and Ronaldo was still nowhere near the Northern Irishman’s level of achievement or fame. Strong arguments could be made for other established United legends – the likes of Ryan Giggs, Paul Scholes or Roy Keane – to be given the gatefold treatment, but Best’s judgement on Ronaldo’s ability had stuck with me. We placed a request with the club, and word came back that Cristiano was willing to do the shoot. We’d asked for a minimum of one hour to do the shoot – we were told we had half an hour. Not unusual for photo shoots with footballers, but this was not going to be an ordinary shoot. 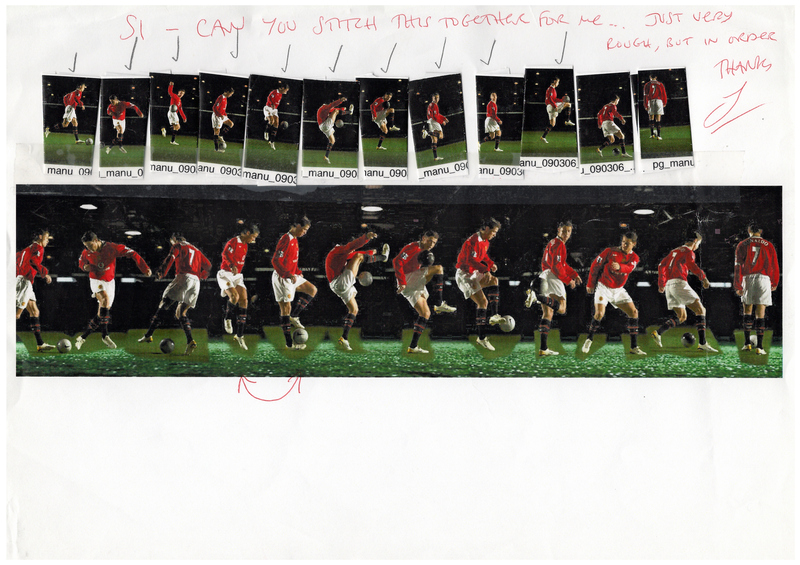 Our idea was to create one multi-photo image, seamlessly sewn together, of Ronaldo showing off his skills. To achieve the look we wanted, we needed a photographer able to capture motion in pin-sharp detail. Opus picture editor, Andy Cantillon, spent days scouring the portfolios of photographers around the world in search of someone who had done such specialist work. There were very few who had done anything like what we wanted. And only one photographer had multiple examples of the high-quality ‘motion’ images we needed to feel confident that they could meet our brief – Patrik Giardino (http://www.giardinophoto.com). Patrik told Andy that when he was doing similar sort of work for advertising campaigns, he’d have at least a day to get the shots he needed, but he was up for the challenge and a date was agreed with all parties. Andy and I travelled up by train from London to Manchester the night before. On the way, I received a call from the club’s press officer. What?! The cost of this photo shoot ran into five figures and the Opus boss had taken a lot of persuading that it was worth it. Now we were looking down the barrel of a postponement for which we’d be contractually obliged to pay the photographer. And even if the shoot did eventually take place, we weren’t even sure that what we wanted to do was possible in the time allowed. Some fairly frantic phone calls followed. Our boss at first wanted to pull out of the shoot, but eventually agreed to hang in there, with the proviso/warning: ‘These photos better be good…’ Patrik kindly agreed to accept a lower postponement fee than he was entitled to. And we were told that Cristiano definitely would be back the next day. So after an unscheduled day introducing Patrik and his assistant to the delights of Manchester, we finally rocked up at Manchester United’s Carrington training ground early the following morning to set up Patrik’s state-of-the-art equipment in the indoor training centre. And then we waited. MUTV, the club’s official TV station, were in attendance to capture the scene. I had to do an interview and pretend to be confident about what was ahead. Fair to say, Andy and I were having kittens – our necks were on the line. Our only comfort was Patrik’s utterly relaxed demeanour as he had a kickabout nearby. A couple of hours later, after United’s training had finished, I was relieved to get the call to say Cristiano was on his way. He arrived a few minutes later, resplendent in the full United kit as requested. After the two days of stress I’d had, I wasn’t too sympathetic to Cristiano’s potential perspiratory plight, but managed to restrain myself from beating him around the head with one of Patrik’s lights. ‘Well, let’s just try and see how we get on…’, I said gently. After he’d completed a couple of sorties past the camera, I encouraged Patrik to show Cristiano the pictures he taken so far. Patrik was shooting on the highest quality digital camera available, and the images were instantly visible on his laptop. They looked bloody incredible, and when Cristiano saw them, his whole demeanour changed. ‘Okay, I try this…’ he said. Then he went off again and did some mind-boggling tricks, before returning to check his work on the laptop. I’d seen him play live in matches many times, but never up so close. The speed of his footwork, athleticism and masterful ball control were simply astonishing. Soon everyone was smiling and laughing – us at Cristiano’s brilliance, and him at the incredible photos being produced – and pitching in with ideas of what to do next. Our allotted 30 minutes passed, by which time Cristiano really was sweating – and if you zoomed in on the photos of him you could see every bead. The shoot that should take a day, was wrapped in 40 minutes, with footballer, photographer, picture editor and editor delighted at the results. And just few days later, we were piecing together a selection from hundreds of photos to create a single fluid montage of Ronaldo in action (see picture above). Our aim had been to create an iconic image of a footballer we believed had the ability to become an icon. Thanks to Patrik Giardino, I think we did that. Two-time World Player of the Year – and now two-time Champions League winner – Cristiano Ronaldo has delivered on his side of the bargain, too.